I hope everyone had a wonderful Winter Break. Now it’s time to get back to work! For Round Rock ISD, report cards come out this week. Does your child need a little extra help in 2014? Not sure tutoring is worth the cost in time and money? If so, I’d love to meet with you, even talk with his or her teachers, to discern ways I can help. I’d be glad to have you try one free session just to see if I am a good fit for your child. 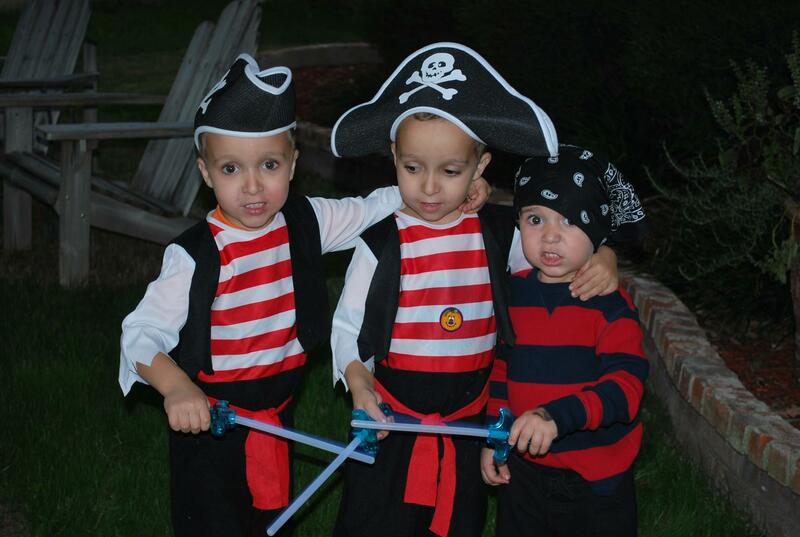 I don’t know about your kids, but my best friend’s little ones are obsessed with pirates. And have been for the last 2 years. That’s saying a lot since the twins are 4 1/2 and their younger brother is 2 1/2 years old. “Doubloons” and “Arrrggh” might even have been his first words! Just to prove it, here are 2 adorable pictures taken on this very Halloween night of 2012. 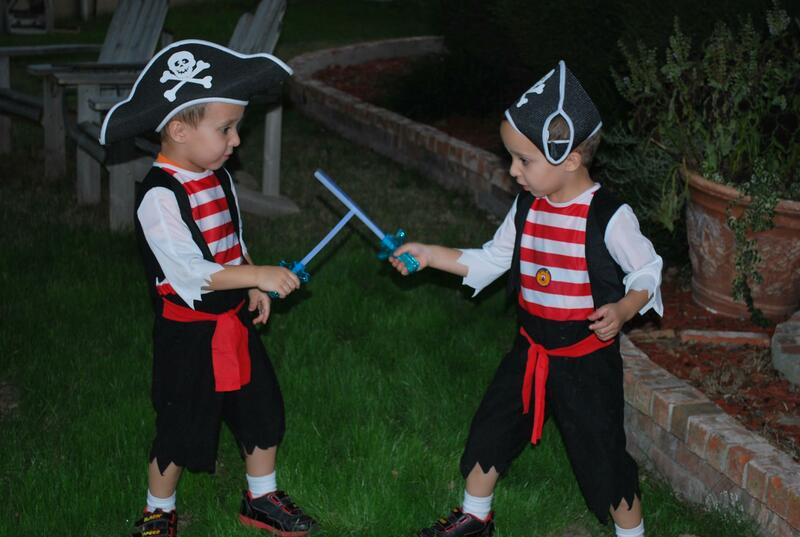 It’s not just kids…my sister-in-law has been obsessed with pirates ever since Pirates of the Caribbean came out. Wait, hers is actually a Johnny Depp obsession. Never mind. 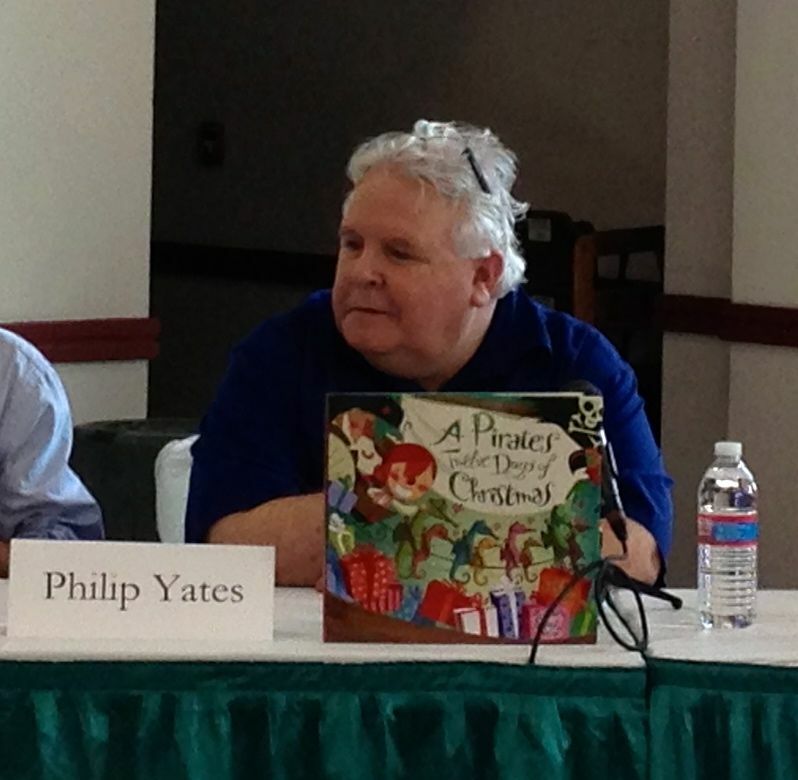 But really, I have to agree with Philip Yates, a local Austin author, who explains his own fascination with pirates and his inspiration for his two picture books, A Pirate’s Night Before Christmas and A Pirate’s Twelve Days of Christmas. in Austin on Oct. 27, 2012. By asking himself questions, Philip Yates created a new take on two well-loved Christmas poems. And every parent knows how important that is, especially on September 19th each year. http://www.talklikeapirate.com/piratehome.html. Always on the lookout for ideas around him, Philip tells of the inspiration for his next picture book. It’s based on a seemingly irreverent statement he overhead at an Austin public library. You know the drill. Halloween’s over now, so Christmas will soon be upon us (if not already in a store near you). 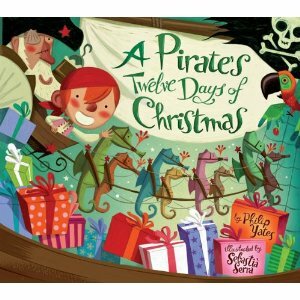 So get out there and purchase two special pirate poem Christmas books for your own buccaneers. I already got my autographed copy for my best friend’s 3 pirates. From costumes to acting, sculpting, or writing and illustrating, this man is an all-around artist who views each of these expressions similarly. He feels you create each in a similar way, adding and cutting to shape the end product. 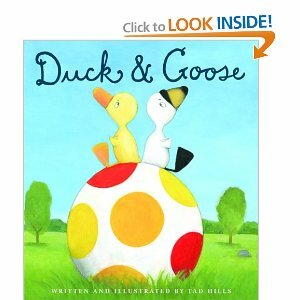 This author/illustrator began writing touch and feel board books, but is best known for his Duck and Goose picture books, as well as his latest two stories about a dog named Rocket who learns to read and write. 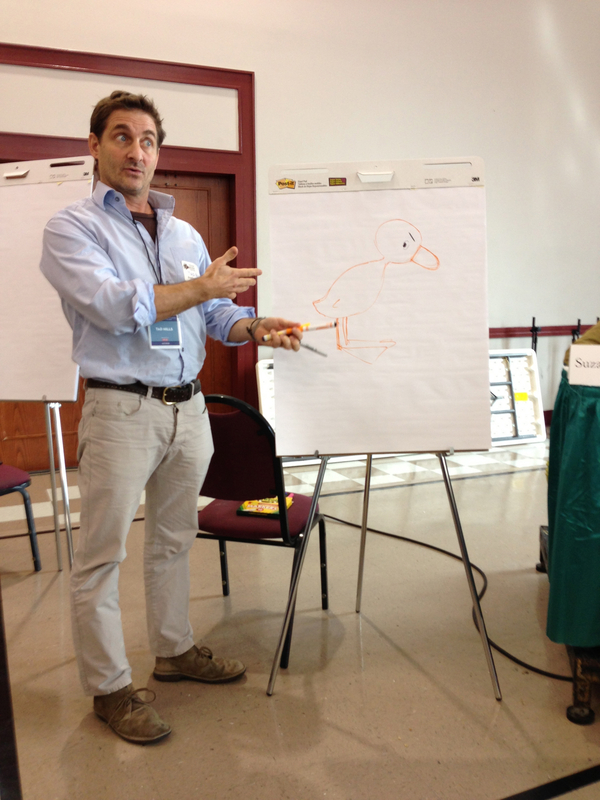 Tad Hills shows how to draw Duck at the Texas Book Festival. I was in the front row and he was 3 feet from me! Tad Hills at the Texas Book Festival introducing his latest Rocket story, Rocket Writes a Story. 3) get up and say VOILA! And writing impacts those around us. Rocket experiences each of these elements on his writing journey. In the classroom, have students brainstorm the things they do and need in order to write a story. List these ideas on chart paper. Make sure they don’t leave anything out. Then read Rocket Writes a Story. Have students list the things Rocket used and did in his writing process. Compare the two lists. “Can you add any of his tools to your process?” This should facilitate an encouraging discussion about ideas and their development. Then, as a fun treat, show them the picture of the real Rocket that inspired Tad Hills (http://tadhills.com/rocket/meet-the-real-rocket). Personally, this story strikes a chord because it’s been about a year now of me nursing 2 manuscripts of my own. My two ideas (a fairy tale and a dog detective story) look radically different than when I began. I, too, have needed breaks, inspiration, peers, encouragement and feedback, time and space. 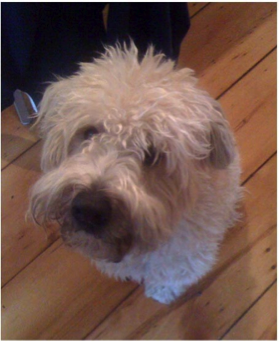 And of course, my great dogs also originally inspired me. I hope you’ll take time to introduce Rocket to your children or students. He’s a model reader and writer! I’ve just returned from the Texas Book Festival and I am pumped up! This free event is located on and around the capitol building in downtown Austin. While there, I got to meet some very cool children’s book authors. I was even able to ask them, one-on-one, a few questions I have as a new writer with my own manuscript in the works. So, for the last few hours I have been singing the refrain “Now I’ve had the time of my life.” And that’s when I thought of you. I’d love to share some insights these authors revealed about their characters and inspiration. As an avid reader, those details further endear to me a story or character I already love. The next four posts for this week (and I promise to do my best to get them out this week while it’s fresh on my mind) are: DRUMROLL, please……………. More photos and stories to come–hope you’ll join me. Thank you to all 10 first grade classes that allowed me to come and read to your kids. It was very helpful and I’ve been able to revise many things in my RUFF draft based on your students’ responses. Please enjoy the pictures below and don’t forget to click on the image to view in the full screen gallery.